Product #60719 | SKU XK-1443-OYRG-BU | 0.0 (no ratings yet) Thanks for your rating! The USB 3-switch interface easily converts any switch closure to a keyboard, multimedia, or mouse command. 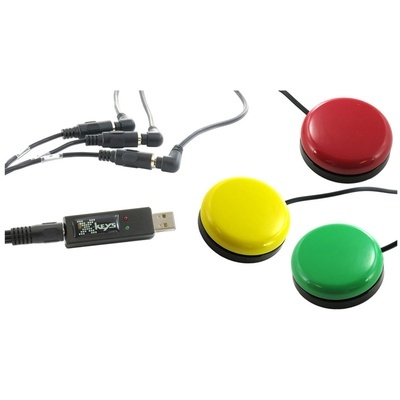 The X-keys USB 3-Switch Interface Bundle with 3 Orby Switches & TRRS 3-Way Splitter Cord includes the USB 3-switch interface, three Orby switches (red, green, and yellow), and a TRRS 3-way splitter cord. The USB 3-switch interface easily converts any switch closure to a keyboard, multimedia, or mouse command. It connects to the three wired switches using the TRRS splitter cord. The splitter cord features one 3.5mm TRRS plug split to three 3.5mm mono jacks. Each switch can be programmed with a function to trigger an action on your computer or tablet.